Bosses from Uber and Deliveroo have told MPs they would have to reduce flexibility and offer less work if they were forced to offer greater employment benefits. The Work and Pensions Committee is examining the welfare system's capacity to support self-employed workers in this sector. Committee chair Frank Field said it was one-sided flexibility. Some five million people work in the so-called "gig" economy. They are mostly employed in sectors such as food delivery or taxi driving. 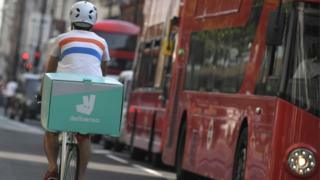 The UK and Ireland managing director of online delivery food service Deliveroo, Dan Warne, said flexibility was extremely important to its riders because 85% of them used it as a supplementary income stream, working on average 15 hours a week. He said its business model also allowed people to work for competitors and no-one was penalised if they did not turn up for work. "We cannot offer that amount of flexibility to those riders if we're forced to pay a given wage and a given hour to every single rider," Mr Warne added. "We would have to restrict the number of riders who login. We'd have to restrict their earning capacity during peak [hours]." The company has also confirmed that it is dropping a controversial clause in its contracts that prevents couriers taking the company to an employment tribunal, contesting their self-employed status. Mr Field said to Mr Warne: "You actually forbid that before you give them work." Mr Warne replied: "This is not something that's enforced, so there is no need to have it in there." All the companies insisted they were paying the National Minimum Wage. But Mr Field expressed scepticism about the fairness of all their business models. "You are not paying national insurance, you're not covering costs which taxpayers will have to pick up. It is a marvellous model if you can get away with it," he said. Andrew Byrne, Uber's head of public policies in the UK, said: "94% of people when we ask them to say the thing they like about working for Uber is the freedom to choose their own hours and that is something that is difficult to hold on to in a market where you have different requirements and different working models." The online private hire company is currently appealing against an employment tribunal ruling from last year that said UK Uber drivers can be classed as workers and not as self-employed. This means they should be entitled to a range of benefits such as the National Minimum Wage, and holiday pay. Carole Woodhead, the chief executive of courier Hermes UK, said the benefit of its model was that couriers were their "own bosses" and they could choose to ask other people to fulfil their deliveries if they were unavailable. She said if a substitute could not be found, they had to inform the company who would provide cover. Frank Field described this as "strange self-employment", since it meant there was some obligation on behalf of the courier. He said if employees were unwell, they could claim sick pay and would not be expected to provide a substitute. Ms Woodhead said Hermes took "its responsibilities seriously" and that the UK tax authorities had found it offered genuine self-employment. She said the company had also met with HMRC officials last December and was awaiting the outcome of those discussions. What is the 'gig' economy? At least 100 people are reported killed and hundreds more hurt in six explosions in several cities.